Nearly Being Steamed to Death…in the SnowCastle? Never did I imagine that a stay in the SnowCastle would result in me nearly passing out from heat exhaustion. As I curled up in my Arctic sleeping bag, leaving only my nose and mouth poking out into the -5C air inside my little dome of a room, the only thing I could think of was not freezing to death. 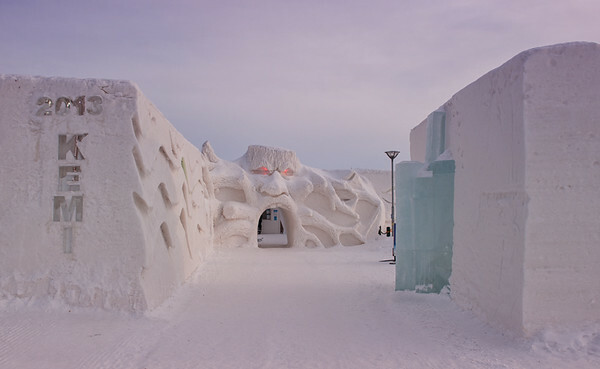 The entrance to the 2013 edition of the SnowCastle. 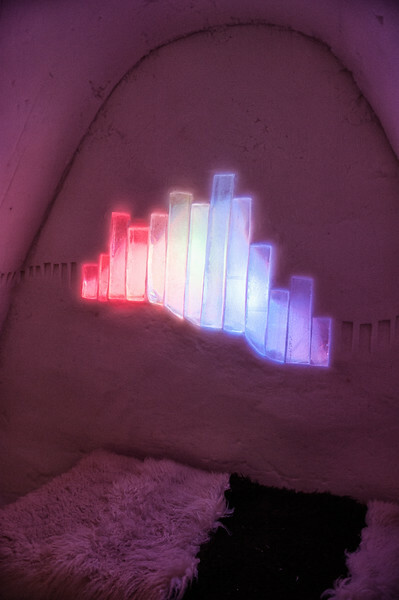 To say I approached my stay at the SnowCastle with trepidation is a complete understatement. I’ve always enjoyed camping and sleeping under the stars, but spending the night in a sleeping bag in a hotel made of snow was definitely well outside my comfort zone. Then again, winter in my house in Brisbane is outside my comfort zone. I sit on the the couch wrapped in blankets grumbling about how it’s below 10C inside the house. This was 15° below that. However, here I was armed with some information that could come in handy when I have to weather another winter with no heating in Brisbane. At the “how to survive a night in the SnowCastle” briefing, they mentioned something that I touched on in my post about sleeping in a Sami tent — one that doesn’t make sense to many people at first. 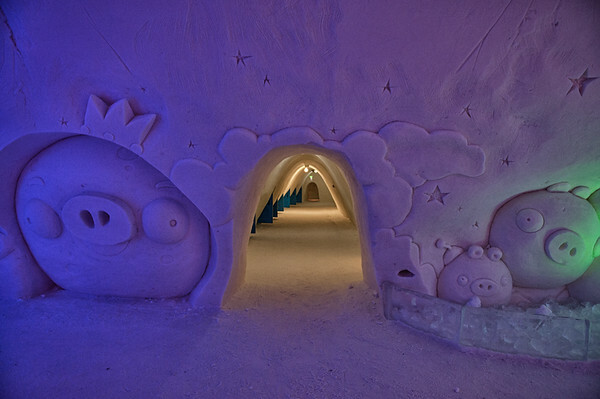 Looking from the Angry Birds room down one of the corridors of the SnowHotel section of the SnowCastle. Rather than slipping into your sleeping bag looking like you’re about to board a RyanAir flight with a carryon that just couldn’t hold all your clothes, all you need is a set of thermals, socks, and a thick beanie. Sleeping bags are designed to conserve and circulate your body heat, but if you’ve completely insulated yourself from its effects — like I did in the Sami tent by wearing all my outerwear — then it’s all for naught. So, when I finally decided that the northern lights weren’t coming out (since I certainly wasn’t getting up for them once I’d gone to bed), I begrudgingly left my outerwear on one of the bed’s reindeer skins and cocooned myself in my sleeping bag on the other. Needless to say, when I woke up and realised it was already 6.30am, it was with a jolt of surprise. Where did the night go? How in the world had I fallen asleep so quickly, and how had I stayed asleep so long? How had I woken up without the ache of cold in my bones? Nearly finished cocooning myself in my Arctic sleeping bag. It was only then that I really believed the SnowCastle’s claim that sleeping in a room made of snow is not as uncomfortable as it may sound. Yes, there are definitely warmer ways to spend the night — but I was much, much colder spending autumn nights in the huts on the Routeburn Track in NZ than I had been in this massive snow hotel in southern Finnish Lapland. In fact, I had one of my best sleeps in a long time since I wasn’t constantly getting up to check for the northern lights. I will admit that I woke up slightly cold, but that was mostly due to the fact that I had thrashed around and slightly unzipped the sleeping bag, letting precious heat out into a room that, being made of frozen water, wasn’t really in need of it. 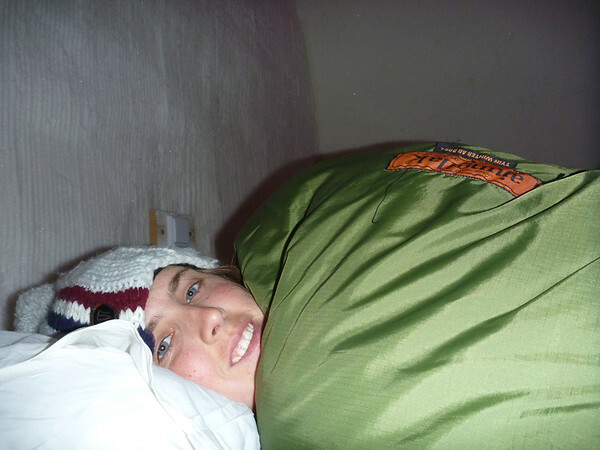 I clung on to the warmth of the sleeping bag as I contemplated getting up. I knew I would be more comfortable once I got into the “warm room” in the wooden lodge next door, but the thought of facing -5°, even if it was only for a moment while I put on my outerwear, didn’t really appeal to me. It was only the threat of missing my morning sauna that finally got me out of bed. At this point, my sleep-addled brain still hadn’t pieced together that a coat that had sat in negative temperatures all night would be, well, cold. My arms balked at going into the sleeves, screaming at me to put them back into the sleeping bag (which would have been pointless since the I had unzipped it and exposed the insides to the cold). My boots were just as chilly but they quickly warmed as I sprinted down the hallway, hardly paying attention to the intricate fantasy worlds that artists had brought to life on the walls of the castle. 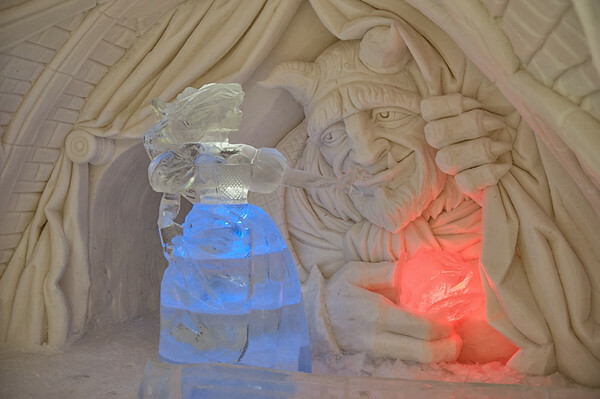 One of many amazing “Fantasia” scenes inside the SnowCastle. After a very welcome breakfast and hot tea, a taxi picked up the three of us — the only three people that had dared to spend the night in the hotel — and took us to the nearby Cumulus Hotel to use their facilities. There, we were given a private sauna (with changing room, communal showers, and a sauna) as well as access to the swimming pool. We all made a beeline for the sauna after only a cursory glance at the sauna instructions. That turned out to be a crucial mistake…mainly because none of us noticed that there was a thermometer on the wall. Not realising the sauna was already heating up past 70°, I offered to pour a bit of water on the coals. Two ladles and a lot of steam later, we were all basking in the humid air, feeling the last of the cold melt away. 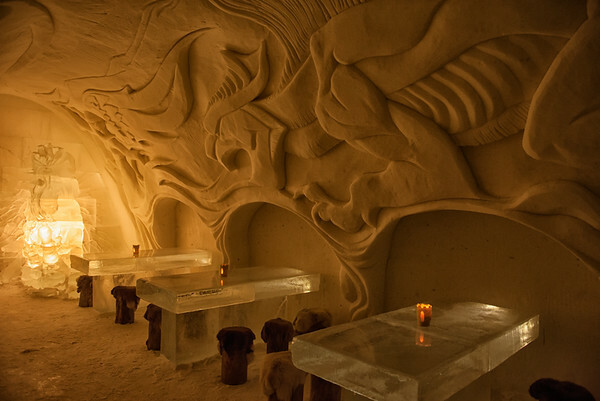 The IceBar: how can a room made of snow have such a warm atmosphere? It felt great for a few minutes, but then the heat became oppressive. Two ladles of water had been entirely too much, and as a result, the temperature skyrocketed. One by one, we gave in to the light-headedness and stepped out of the sauna, the blast of seemingly Arctic air (that was really about 20°) making us all the more wobbly. Instead of sitting gracefully, I sort of flopped onto one of the dressing room chairs as dizziness took over. It was only then that I decided to read the instructions — instructions that cautioned against using too much water at once and that advised keeping an eye on the thermometer on the wall. The temperature they advised was about 80°. When I went back in to check, the temperature was slowly easing past 120°! Dragons breathing fire into the otherwise slightly chilly dining room. Believe me, Sami, I know. But then again, it was a great way to put things in perspective. After being subjected to that heat, the -5° that I had slept in seemed like a perfectly reasonable temperature! Would you spend a night in the SnowCastle (or any of the other snow hotels scattered across Lapland)? The fantasy world of the Angry Birds. It’s Finland, so they couldn’t leave out their most famous ‘fantasy’ creation! I visited the SnowCastle as a guest of Kemi Tourism and Visit Finland, but all opinions stated here are my own. The SnowCastle is open from late January to early April every year. 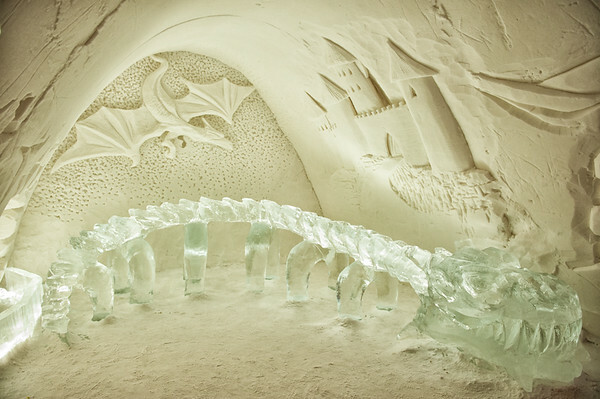 Each year, the whole castle is carved out of ice from the Gulf of Bothnia to a specific theme. 2013’s theme was “Fantasia,” dedicated to all things fantasy, and it was done brilliantly. 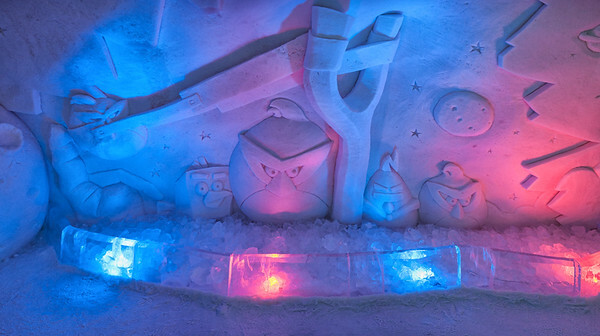 Rooms were filled with ice statues of princesses, beasts, dragons, and even the Angry Birds, and magnificent carvings adorned all of the snowy walls. The rooms themselves (aside from a few suites) were simple domes with no carvings and a double bed. The bed actually has a mattress (rather than just a block of snow as I mistakenly thought before arriving) and is covered in reindeer skins. I was really impressed by this ice dragon! 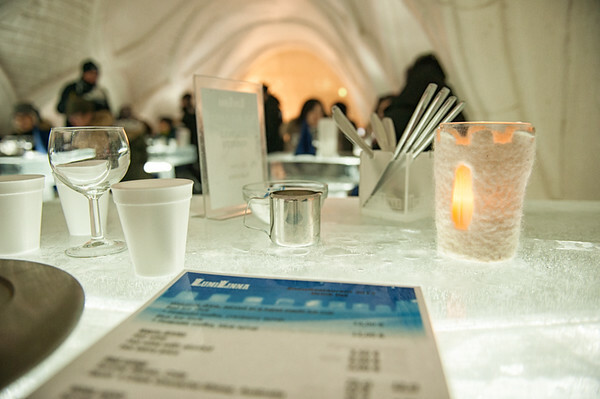 The SnowCastle also has a SnowRestaurant, where you can dine in -5° on a table made of ice (so be sure to bring your gloves and beanie!). They serve lunch and dinner (at 12pm, 2pm, and 7pm) daily, but reservations must be made in advance; that’s because they need to know exactly what to cook so they can bring it out as quickly as possible. My meal was the €50 “Feast á la SnowCastle,” which included a smoked salmon soup, a fillet of reindeer with game sauce and lingonberries, and a strawberry mousse for dessert. I also had hot non-alcoholic wine to keep me warm in the short breaks between courses. The meal was delicious (albeit probably not quite as good as the price suggests) and came served in foil to keep it from freezing before I could finish it! The SnowCastle is also open during the day for visitors that want to tour the castle or go down the (very fun) ice slide. It costs €15. If you can afford it though, I really recommend sleeping there (single rooms €155, double rooms €125/person) — it will really surprise you and is an experience that will stick with you for a long time afterwards. 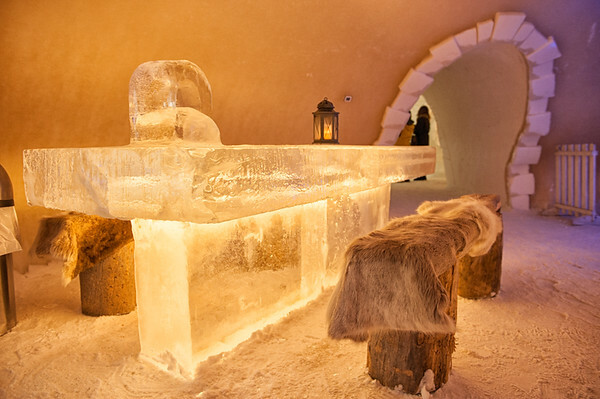 Plus, it’s much cheaper than the IceHotel. Yeah the whole castle is really well insulated — no matter how cold it is outside, it’s always around -5C inside. Same with the IceHotel, where it was verging on -20 outside and still only around -8 inside. Definitely a place to eat/stay for only one night though! As I said to you before – you were a braver soul than me! Truly! Great write up of the experience, which I’m sure isn’t one you’re going to forget in a hurry! Thanks Frankie! I definitely won’t be forgetting my nights in the SnowCastle or the Icehotel in a hurry — which is good because it means I won’t need to stay in them again. Good experience but it’s definitely more of a once-off (although if I were to do it again, it would definitely be at the SnowCastle rather than the ridiculously-priced Icehotel).